The Good Soldier Švejk by Jaroslav Hašek is one of the most classic positions in the history of the Czech literature. 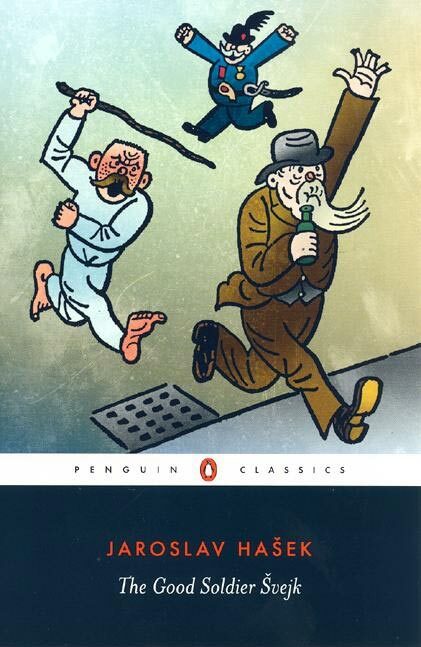 The Czech original title is Osudy dobrého vojáka Švejka za světové války, which means more or less “The Fateful Adventures of the Good Soldier Švejk During the World War”. The novel’s protagonist, Josef Švejk, is a good-natured fellow drafted into the Austro-Hungarian army during World War I. His goal is to survive the brutality of the war. And he does so in his own special way: either by being an idiot or pretending to be one. He was a “certified idiot”, but was his idiocy in reality a very smart thing to do? His character has had a profound influence especially on Central European culture. In several towns, there are Švejk statues; several pubs and restaurants have been named after him. This book is a must-read position for all people interested in the Czech culture. It is simply a timeless classic. This edition includes beautiful illustrations by Josef Lada.